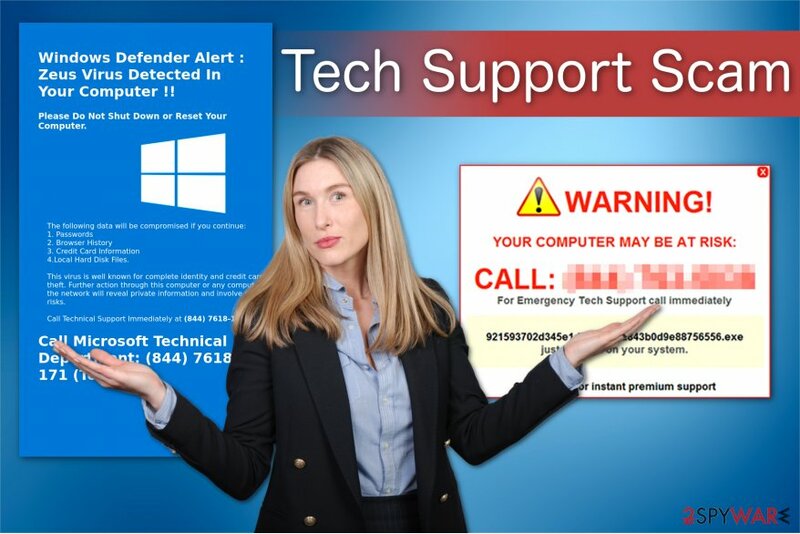 Tech Support Scam virus is a fake program which is created to trick users by providing fake alerts. Get rid of the PUP from your system and do NOT contact the fake tech support! Tech Support Scam virus – a cyber threat which relies on social engineering. The scam has been operating as a deceptive message claiming that the user's computer is infected, compromised or blocked due to different reasons. However, we can assure you that these pop-ups are fake and that your system is targeted by Tech Support scammers who are willing to trick you into contacting them via the given number. This type of scam involves both computer and phone technologies to extort money from computer users. 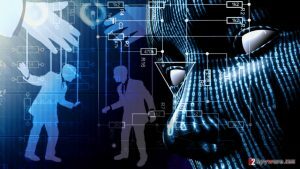 The criminals involved in such scams usually employ tech knowledge and also human psychology to involve their victims into their fraudulent calls. After being contacted, Tech Support scammers either install suspicious software or simply sign up victims to services which they don't need. Even though the scammers might invent fake companies, they typically work under famous names, such as Microsoft Tech Support, Apple Support, etc. They try to trick the users into obtaining unnecessary products or services which may not even exist. If they do exist, though, they may be merely non-functional or also hazardous to the PC. Therefore, if you ever see a notification on your computer, claiming that your system is infected with malware or some other system malfunction has unexpectedly occurred, carefully inspect and evaluate this message before taking action. Note that you cannot get a Tech Support Scam refund if the criminals manage to swindle money from you. Likewise, the smartest choice would be ALWAYS to use professional anti-malware software to help you avoid phishing attacks and protect your system from real cyber infections. For that, we suggest using Reimage since it is developed to ensure a quick and safe Tech Support Scam removal for regular computer users. Additionally, we will attach manual elimination instructions which will show you how to remove the Tech Support Scam virus from both, Windows and Mac operating systems. The only thing we ask is to follow the guide attentively to avoid any misunderstandings and computer damage. This Tech Support Scam popup begins with a computer infection. Usually, people unconsciously infiltrate a potentially unwanted program called adware on their systems. It might reach your computer via software-bundles or other deceptive distribution techniques. Adware program starts delivering Tach Support Scam warnings not only on suspicious websites but they might appear on your frequently visited sites as well. So, there is actually no way of indicating what websites you should avoid. Of course, it is always recommended to keep away from obscure and less than reputable sites, but remember, there are no guarantees that such dubious ads will not pop-up on your favorite news page or social networking site as well. It is difficult to pinpoint what exactly do these ads claim because there are numerous different versions and Tech Support Scam numbers currently roaming the Internet and every one of them may use their tricks to outwit you. The scammers may pretend to be representatives of Windows Helpdesk, Windows Service Center, Microsoft Support or similar supposedly Apple Help Center. What is know for sure, though, is that these notifications may feature security-related warnings about malware infections or offer you to obtain a subscription to remote technical support to solve your computer’s issues. These notifications always indicate a Tech Support phone number which the user should call to receive or purchase these services. Unfortunately, if you tried calling the number, you would be immediately connected to a Tech Support scammer rather than a remote professional technician or the Microsoft representative. In such a case, you should hang up at once and scan your computer for malware responsible for generating these warning messages. The person behind the phone claimed that he is a Microsoft representative and asked to give remote access to the computer. Later, the user was asked to pay $90 for a three-month support subscription. However, this was merely a phishing attempt which led to considerable financial loses. Note that giving remote access to your system is extremely dangerous — criminals can easily infiltrate various computer hazards to force you to continue using their fraudulent services. Also, by calling them, you unconsciously provide your phone number which might be later used for further phishing attacks. If you called the “support,” any demands to access your system remotely or purchase an expensive security software indicate a scam. 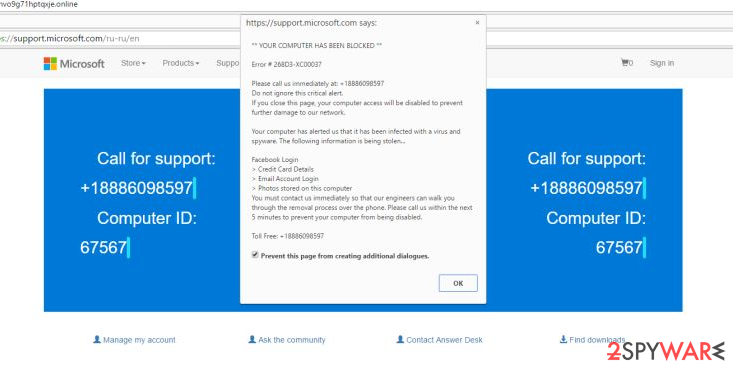 Tech Support scam virus delivers a fraudulent warning message and urges to fix victims' computers by calling fake tech support number. Since such deceptive alerts appear due to the presence of an adware program, the distribution of this virus is similar to other potentially unwanted programs'. You can easily infect your system by not paying attention when you download/install free applications online. To prevent this, you should take your time when installing newly downloaded software and always choose the Advanced/Custom installation mode. Also, remember that you must opt out suspicious or unnecessary software package components in the program’s setup if there are any. Also, be security-cautious online as well. Refrain from visiting unreputable sites, do not click on suspicious links and advertisements. This will help you stay a few steps further from getting infected with such malware. However, do not cross out the possibility of getting infected and equip your system with tools capable of indicating and removing the infection. 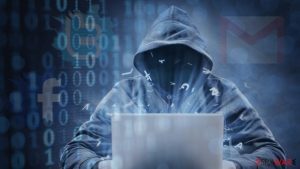 Adobe Flash Tech Support Scam virus has recently emerged on the cyberspace with the same goal — to swindle money from gullible people. According to the research, it spreads together with freeware or comes as a fake Adobe Flash Update. 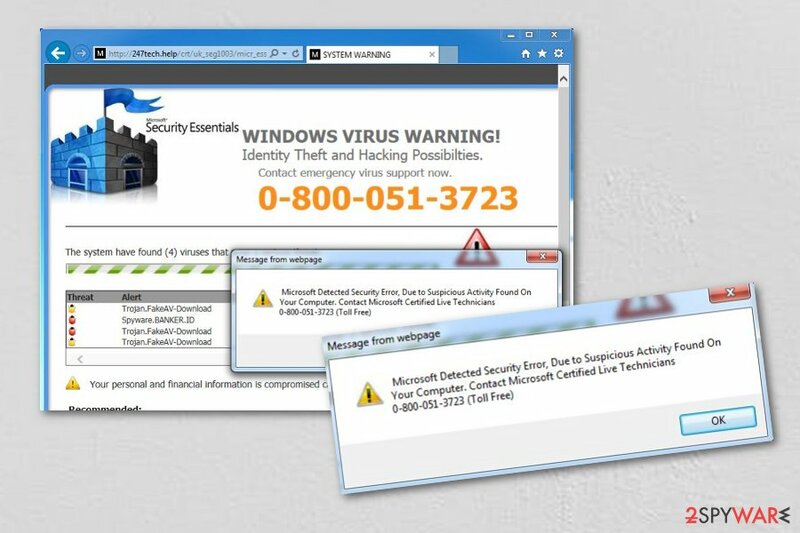 Once it settles on the system, users receive a message claiming that Windows has been blocked due to suspicious activity and the phishing attack begins. Pretending to be representatives from Microsoft, these scammers will urge the user to dial 1-888-322-9655 in order to contact remote technicians and “fix” the supposed issue. 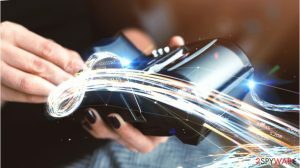 In reality, the extortionists are simply trying to gain full access and control of the user's computer or attempting to swindle out sensitive information such as credit card details or online banking credentials. In case you suspect you have become a victim of Adobe Flash Tech Support Scam, cut the network connection immediately and block bank accounts you've provided the scammers the access to. Microsoft Inc Warning! Support scam virus. Just like most tech support scams, this parasite also operates on behalf of Microsoft technical support. 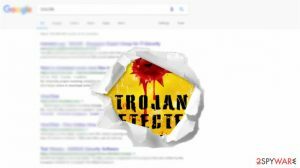 The program is designed to drop notifications alerting the victim about a Trojan virus infection, tricking the user into believing that his/her sensitive information, including banking details, credit card information and account passwords are at risk. To stop this supposed invasion, the user has to ring up the “Microsoft technicians” with a toll-free number 1-844-507-3556. Of course, the purpose of such a call is entirely different to what the users are made to believe. During the conversation, the scammers may try to convince the victim that his/her computer state is critical and that he/she must buy some security utility to repair it. Also, they may try to gain the computer's administrative, steal the sensitive information stored on it or install some malicious keylogging software to spy on the victim even after the Microsoft Inc Warning! Support scam virus is eliminated from the computer. 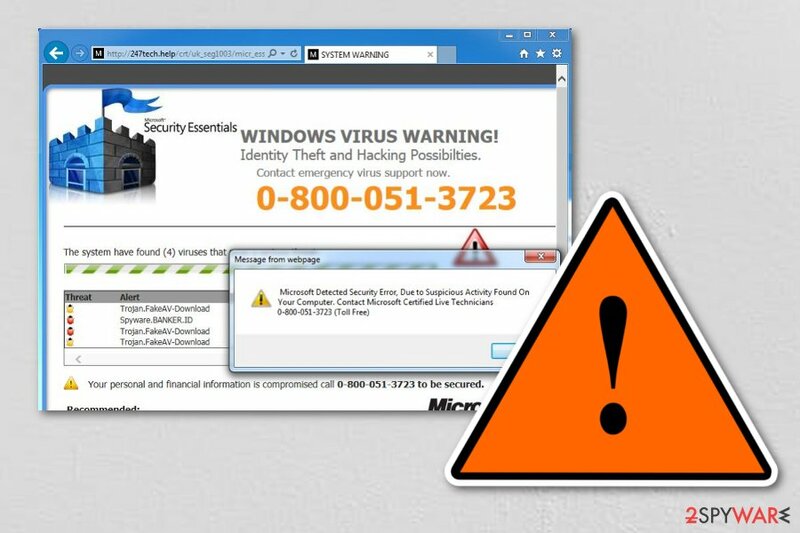 Error 268D3-XC00037 Tech Support scam virus generates pop-ups that issue the message claiming that “YOUR COMPUTER HAS BEEN BLOCKED.” At the end of this warning notification, the user is provided a phone number (+18886098597) to call for help. Again, instead of being put through to the technicians from Microsoft, the users who call this number fall into the trap of the fraudulent salespeople that only try to sell them fake products or services. On top of it all, the virus blocks the victim from accessing security sites and downloading security-related software. Such program must be terminated without hesitation or delay. In case you provided some of your personal details to the scammers, you should also contact the corresponding institutions, to protect yourself from identity theft or financial loss. If you have followed the steps provided above to identify Tech Support Scam virus and found one on your system, not NOT call via the provided number. In case you are asked to give some personal details, do NOT do that as well. Remember, any personal information might be used to gain money from you. If it is too late for that and you have already given your details and free access to your computer to the criminals, there might still be time to prevent further damage. If the scammers are still connected to your system, terminate the connection immediately. Close the remote access application or reboot the computer. You can quickly get rid of Tech Support Scam popup by uninstalling the adware from your computer. However, you should first scan the system with a robust anti-malware software to identify whether hackers managed to infiltrate other high-risk computer infections on your PC. 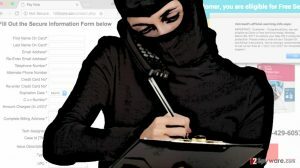 Experts from NoVirus.uk warn that criminals may have installed some key-loggers, Trojans or worms on your computer to spy on you in the future and steal your data. In this case, it would be impossible to detect and remove all potentially dangerous programs on your own. In fact, by doing that you might even permanently damage your system. Likewise, you should remove Tech Support Scam with professional security software and let it scan your system for other infections. After that, it is important to make sure that criminals won't be able to use the gathered personal information (If they have collected it) in the future. For that, change your system passwords, all the social, email login details, and your online banking passwords. If you went even further and provided the criminals with your credit card information, inform the credit card company or related bank about it, and they will inform you about the further steps that need to be taken to protect your account. Also, if the crooks are now aware of your sensitive information, such as SSN, home address, date of birth, etc., you should contact the FTC’s and inform them about the potential identity theft. Finally, after Tech Support Scam removal, you might need to reset your browser settings. We have prepared the instructions on how to do that for all most popular browsers, such as Google Chrome, Mozilla Firefox, Safari, Microsoft Edge, Internet Explorer, etc. You can find them at the end of this article. Tech Support Scam virus is a pop-up which might add some rogue content to web browsers such as Chrome, Firefox, Explorer, etc. Since there are numerous versions of Tech Support Scam virus, it might be using different names. You should check your Windows system for any suspicious programs. Here, look for Tech Support Scam or any other recently installed suspicious programs. 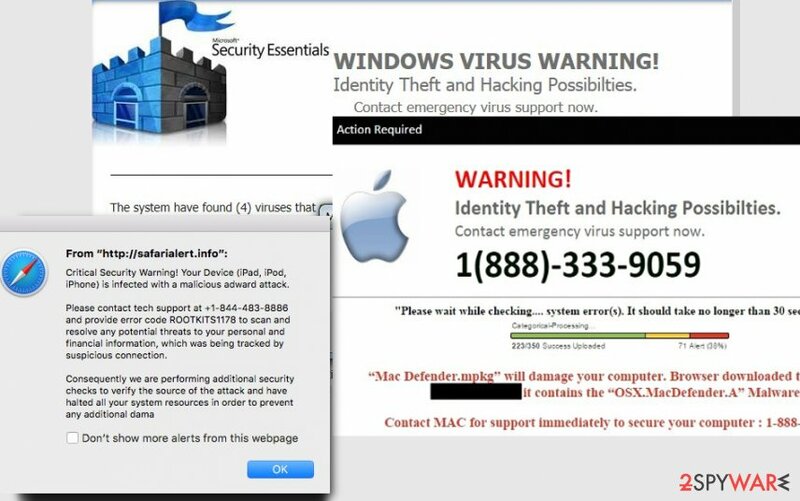 Users who think that Mac computers are less targeted by scammers should rethink this option — there are a vast of fake messages delivered by adware programs on Mac OS X. You should search for suspicious names which might be related to adware. Wait until you see Applications folder and look for Tech Support Scam or any other suspicious programs on it. Now right click on every of such entries and select Move to Trash. When in the new window, check Delete personal settings and select Reset again to complete Tech Support Scam removal. If you have received a fraudulent warning on Mozilla, search for new entries which might be linked to the adware. Later, remove them and reset your browser. Here, select Tech Support Scam and other questionable plugins. Click Remove to delete these entries. Now you will see Reset Firefox to its default state message with Reset Firefox button. Click this button for several times and complete Tech Support Scam removal. If you want to clean Chrome and stop delivering fake popups, you must check for the components of the adware and uninstall them. Since they might hide under different names, it is important to be attentive. Here, select Tech Support Scam and other malicious plugins and select trash icon to delete these entries. Click Reset to confirm this action and complete Tech Support Scam removal. Here, select Extensions and look for Tech Support Scam or other suspicious entries. Click on the Uninstall button to get rid each of them. Now you will see a detailed dialog window filled with reset options. All of those options are usually checked, but you can specify which of them you want to reset. Click the Reset button to complete Tech Support Scam removal process. ^ Margaret Rouse. Adware. Tech Target. Computer Glossary, Computer Terms. ^ Remote Access. Techopedia. Tech terms and definitions. This entry was posted on 2019-02-19 at 03:27 and is filed under Adware, Viruses. You can quickly scan the QR code with your mobile device and have Tech Support Scam virus manual removal instructions right in your pocket. 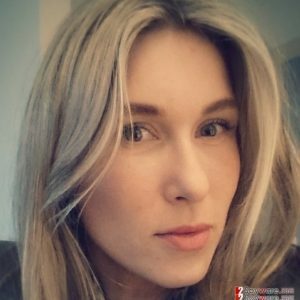 How did you remove Tech Support Scam virus?